Via PaperTiger, this is reported in the Los Angeles Times: Beijing's Losing Hand by Mark Magnier, April 13, 2005. "We've declared war on gambling," Zhou Yongkang, head of the National Public Security Bureau, said in announcing the campaign. "We must stop the spread of this illegal activity." The government has closed thousands of underground betting parlors that were defying the long-standing official ban on gambling (a bit of mah-jongg with friends excepted). It has pressured neighboring countries to shut down their casinos at the border. It set up 24-hour hotlines and websites to report gamblers and tightened rules for officials going overseas. Beijing has released a blizzard of statistics about the campaign's effectiveness. Dozens of casinos just across China's borders are "dying," according to the official New China News Agency, while 100 have reportedly been driven out of business. Hundreds of thousands of gamblers have been questioned or temporarily detained and tens of thousands have been arrested, most of them released after paying a fine. Even as the campaign continues, however, some Chinese are quietly lobbying the government for a more "realistic" approach to an activity sometimes described as part of their psyche. They may be making headway with one powerful argument: Allowing gambling would prevent billions of dollars from leaving the country. "Gambling is a big part of Chinese human nature," said Hu Xingdou, economics professor at the Beijing Institute of Technology. "Trying to ban it completely is just not going to happen. China also loses an incredible amount of money overseas every year." Numerology, superstition and a get-rich-quick mentality are deeply ingrained in the world's most populous country, particularly in rural areas, sociologists say, and they find expression in gambling. China is also playing catch-up. There's enormous pent-up demand as people start to enjoy more freedom to travel and spend their money on entertainment, after decades spent under a repressive regime. 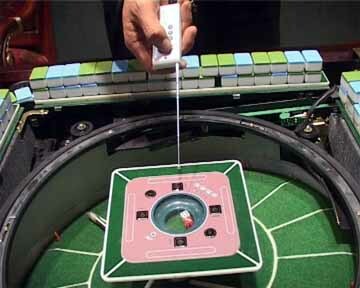 Rather than crack down, these experts suggest, Beijing should consider legalized gambling that is tightly controlled. Even conservative countries like Singapore and Malaysia are opening casinos to attract Chinese tourists. Why shouldn't China get a piece of its own action? Ah, yes, even more justifications can be found in the following story of a gambling den raid -- it is necessary for China to operate and/or regulate the casinos to protect the consumers! This news story was posted at Wenxue City. The location was the city of Haiding. In early April, the public security bureau received a tip that there was a gambling den at the presidential suite of a certain bathhouse. On April 10, a team of undercover detectives proceeded to the bathhouse and pretended that they were customers. At around midnight, a regular customer knocked on the door of the presidential room. When the door opened, the policemen rushed in. The more than thirty gamblers inside were stunned. Here is the photo at the scene, in which the gamblers all wore white bathing costumes. At the scene, the police found more than 700,000 RMB in cash. Furthermore, the police found a black leather case containing a large number of loan agreements with amounts varying between 30,000 RMB to 170,000 RMB as well as a number of real estate certificates that were used as loan collateral. During the interrogation, the police pieced together the details of the operation. The organizer was a man from Henan. The customers are all regulars, most of whom are sub-contractors. At this high-class and secure gambling den, the customer must pay the sevice workers 100 RMB each time to work as lookouts for the police. Upon arrival, the customer changes into the white bathing costume, and then proceed to the presidential suite with their cash held in a leather bag. There are four to five young men dressed in black who will provide loans to the gamblers. The mainly interest is more than 600 RMB for each 10,000 RMB. One gambler owes more than 300,000 RMB and another's house is in the hands of the loanshark. Yes, but so what? This is just an ordinary run-of-the-mill story. Ah, but the police also found the gizmo in the following photo. There was a remote control device, with buttons marked with the numbers 1 through 6. You press any number, you roll the die and you are guaranteed to get the number of your choice! This was how those debts keep piling up!